Was preparing to wrap these up and park them somewhere and it occurred to me I'd never photographed them together. 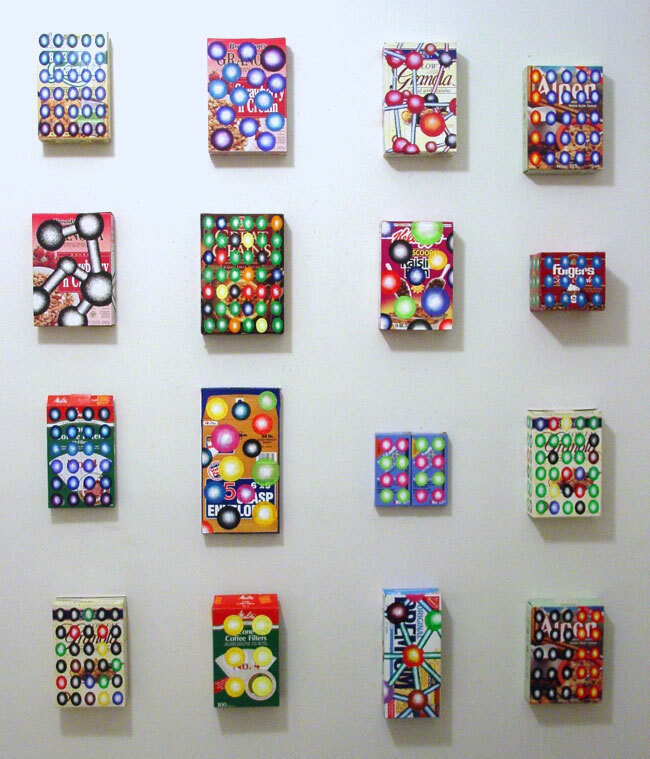 The spheroids are painted directly on the boxes in acrylic - in the case of a couple of boxes the pattern is made on a computer, printed, and glued on the box. In the '90s these were criticized as a "step back from the Brillo box" in that the packages are altered/adorned rather than just presenting the design as a found object. Since their roots are equally in folk art it seemed limiting to peg their success/failure purely in Discourse terms, but I can't control the spin. One thing that interests me about them now is the "default" nature of the materials. The paint is premixed, straight-from-the-jar color and the boxes are about as ordinary as it gets. They hang on the wall with pins inside the box. This work was never shown together (until now) but individual boxes made the group show/art fair rounds. One was reproduced in Art in America; another was my first pic on the Internet--a photo someone took accompanying a review on a long-disappeared '90s website. I sold one and traded another with an artist I admire. I still believe in this work. As Socrates said, "the unexamined garbage is not worth tossing." Update: After posting this several of these sold. Many thanks.